Cried when hit by pitch in little league game, 5/23/76. Scored basket for opponent of own 7th grade basketball squad, 2/11/80. Committed 3 errors in 1 inning for Babe Ruth League team, 6/09/82. Quit Babe Ruth League team, 6/10/82. Drifted around Europe for two months after college, unable to get laid, 9/8/90 — 11/13/90. Fell off cliff 10 seconds into mountain-biking career, 3/16/95. Randomly punched in face outside International Bar, Manhattan, 2/12/98. Fun Facts! Josh has a very limited sense of smell. Fun Facts! Josh dislikes all fruit with the possible exception of the controversially ambiguous tomato. Fun Facts! Josh is generally pretty punctual. Fun Facts! Josh sometimes wakes in the middle of the night hyperventilating, terrified by thoughts of death. Voted by peers in Lower Manhattan Liquor Clerks League most likely to get overwhelmed by youthful urban team of shoplifters, 1992. In same year, finished third in league voting for most likely to be wounded by gunfire. Josh resides in Chicago, where he enjoys taking long aimless walks and visiting the public library. 1. I don’t really like Chicago, but I will admit that it has a pretty sweet library system. However, they should allow you to check out books if you have small fines on your card. Also, the main library is overly large and confusing. My comments on the library are obvious attempt to sow up my own ennui award. Please cite your source on this. I have a couple of associates in that region who bored the f* out of me in those years. They must have been piling up the ennui like Ichiro piles up hits! 5. To my real cousin. I have really enjoyed reading about your passed. Sorry your sox’s are about to make the World Series, not. 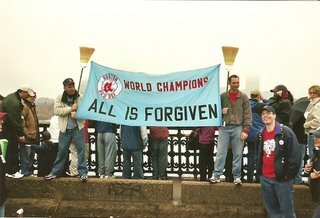 I have been a Phillies fan for ever,. I remember the 64 Phillies. You know they reached 10,000 lost this year, Well I saw 9,5000 of them. Now thank god for the 2007 Mets, they made me feel sooooo much better. My mom, your aunt didn’t keep my old baseball cards so I had to start over again. 6. Great to hear from you, Jamie. I remember you and Nachama and your dad taking us to see the Phillies (I mention that game in the post on Bud Harrleson).